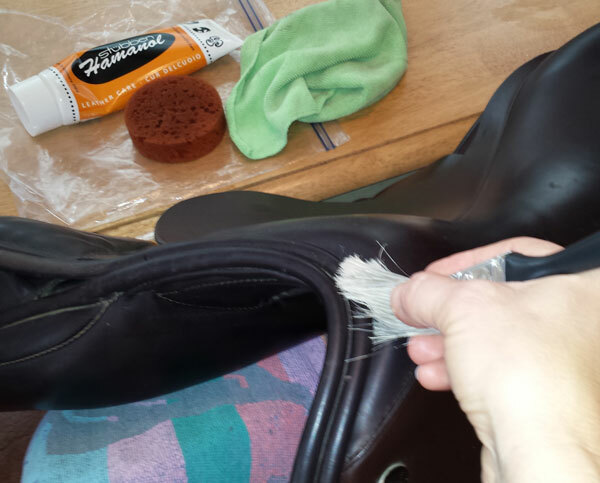 I’m cleaning my new custom-made saddle (thank you Mr. Withers) for the first time today and I — thankfully — remembered an invaluable tip I learned long ago from a groom for the Budweiser Clydesdale team. In my younger years, I had the good fortune to be exercising horses at the very barn that housed the team when it was in town for the Houston Thanksgiving Day Parade. So, of course, I had to go flirt a bit with the staff in hopes of getting closer to the big guys (it worked). The entire experience was amazing and I actually learned a bit about working with the big guys which, funny thing, has come in handy. But my biggest take-away was their secret for squeaky-clean tack. Before they touch any piece with a cloth, sponge, soap or oil, they go over the entire surface with a $2 paintbrush (ok, not really sure about the price of theirs, but I picked up one for $2). Brushing down your tack, especially pieces with stitching, crevices and such is the best — and really only — way to dislodge the dirt and dust collected there. I’m sure you’ve seen tack that, from a distance, looked pristine, but up close had sticky grime along the rolls and folds. That’s the buildup of soap, oil and leftover dirt that collects over time when you clean without sweeping out the tight spaces. Surely the Budweiser grooms never had to deal with this – but I have! If you have a saddle with this buildup, gently scrape it out with a wooden cuticle stick. I’ve found that the angle and edge make it easy to get under the dirt without gouging the leather. Follow up with a good brushing, a damp cloth, and your regular cleaning. Then, the next time you clean, brush everything down first and you won’t have to deal with the grime ever again.